It's springtime, and I'm starting to think about planting the garden again. I'm also hoping that we'll get more rain this year so that things will actually grow. Last year was a bit disappointing, though I did get enough jalapenos to make quite a few amazing Poppers! I tend to plant a very basic vegetable garden - tomatoes, peppers, green beans, zucchini, chard - good stuff to eat. Nothing too creative, but it's so much fun to watch how little seeds or little plants grow and become food! 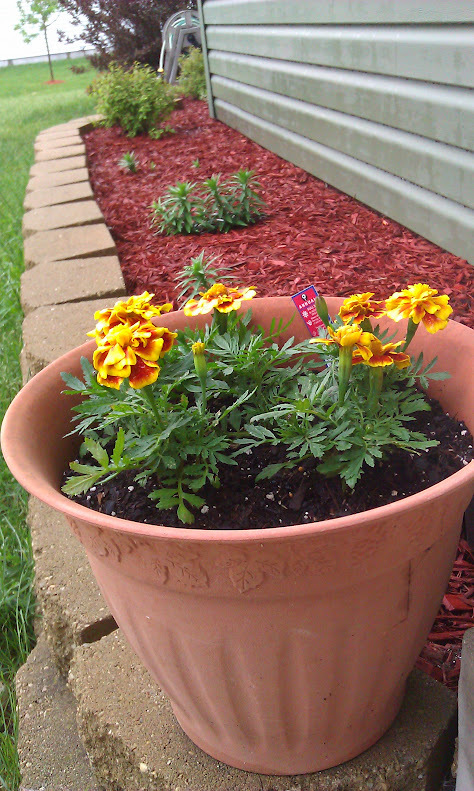 This year I got a little creative and planted some cheery marigolds in a pot out front. I'm also planning to either plant some more of those or some other flowers, or perhaps a combination, in a couple pots out back on the deck. It's really easy, and it dresses things up so much having that bit of color. 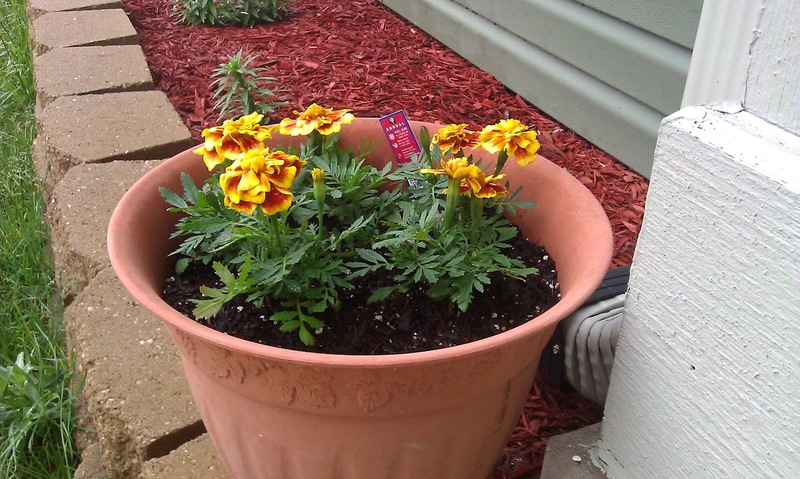 You will need - a pot or container with a drain hole, annuals from your garden store, potting mix. Fill pot about 1/2 full with Miracle-Gro Moisture Control Potting Mix. Arrange plants in pot. Add or take away Potting Mix to bring plants up to the level you want them. Once you've got all the plants where you want them, fill in with Potting Mix between and around the plants, covering the roots completely. Press down lightly. Water thoroughly, and enjoy your new flowers. Since they're in a container, they will need watered occasionally, but the Potting Mix absorbs 33% more water than ordinary soil, so it won't dry out as fast, and therefore won't need watered as often. I love that, because I do tend to forget. If you're interested in some creative and fun gardening projects, please check out The Gro Project from Miracle-Gro. You will find many more great gardening ideas, all of them a lot more creative than mine, like the Toyarium, Ukulele Garden, Origami Garden, G.Y.O.B. or Thrown Down. Even the names are creative! The Miracle-Gro website is also a great resource for gardeners and growers. They have an expansive library of articles and videos full of expert gardening tips for beginners and professionals alike as well as online tools to help growers solve common garden problems. Since I've branched out a bit from just planting vegetables - which I would highly recommend, by the way - I'm thinking of looking through the Gro Project ideas and seeing what else I can do. See what happens when you start playing in the dirt? You want to keep doing it! Also be sure to share your projects on the Miracle-Gro Facebook page or on your social networks with the hashtag #MiracleGroProject and follow the Miracle-Gro Pinterest page for ideas on all kinds of fun garden projects and to share stories and projects with other gardeners.